Whether they are looking for a breaking news update, a new pair of dress shoes or a place to purchase airline tickets, today’s consumers can take their digital business anywhere – causing companies to scramble to find and implement technologies and strategies that can make their websites stand out from the competition. Personalization is fast becoming the best way to do so. At its most basic, personalization is a technique that alters the presentation of a website’s content to match a specific user’s preferences. At its most advanced, it is about delivering a truly custom experience to each individual user. Companies with personalization strategies currently in place are engaging consumers with relevant content and customized experiences – increasing the likeliness of them converting and becoming repeat visitors. With Janrain data revealing that 74 percent of online consumers get frustrated with websites when content appears that has nothing to do with their interests, it is clear that brands across all verticals must put a greater emphasis on catering to their customers’ wants and needs. So how can they (and you) get started? In this issue, Website Magazine delves into personalization and engagement tactics that can help enterprises thrive. The challenge with implementing these initiatives, however, lies in collecting meaningful data and then using that data effectively. Although the majority of brands have been collecting customer data for years, most aren’t the least bit prepared to use it to speak to consumers one on one (or 1:1). The numerous channels available to today’s consumers (social, search, email, etc.) has left many brands overwhelmed with an abundance of “siloed” data, causing inconsistencies when trying to deliver both a personalized and consistent experience to website visitors on mobile and desktop devices. One of the biggest challenges that marketers face in the evolving purchase funnel is creating true 1:1 interactions. Complicating brands’ data collecting initiatives even further, however, is that 83 percent of consumers admit to giving false or incomplete information when registering for a website, according to the “Value of Social Login” study, which was conducted by Blue Research and commissioned by Janrain. Often, this is the outcome of consumers hurrying through the registration process so they can get back to the task, or tasks, that they initially came to the website to do. Fortunately, there are technologies available that can help brands minimize low-quality data, with one of the most effective being social login. Social login enables customers to log in or register for a website by selecting their preferred identity from networks like Facebook, Google or Twitter. By implementing social login, brands ease the onboarding process for consumers, which provides a variety of benefits for both end-users and brands. For starters, social login gives consumers one less username and password to remember, which has resulted in a 50 percent improvement in registration conversion rates in some instances. In addition, the technology and subsequent tactical approach helps brands collect richer customer profile data from each consumer’s social account, as well as keeps that data updated. With the majority of consumers active on social networks, brands are able to collect more accurate and meaningful data than they could from their own registration forms. Ready to get started? Compare four top social login solutions at wsm.co/lisocial4. It is also important to note that social login data can typically be integrated into customer relationship management (CRM) platforms, which enables brands to add information, including rich demographic and psychographic profiling data, to customer records. This helps enterprises cultivate a unified view of their customers, which is difficult to do in today’s fragmented market. Once a brand has created a richer and more unified view of the customer and their activity, they can get to work on their personalization strategies. Gartner’s “2015 Marketing Spending Survey” reveals that customer experience was the top area of marketing technology investment in 2014, which is further proof that providing unique experiences is vital when it comes to achieving a competitive advantage. Novice mistakes, however, are easy to make when implementing new strategies and/or technologies. RichRelevance Director of Product Marketing Devang Sachdev, for example, notes that one common misstep is using add-on solutions, which may seem like the most simple and convenient option, but provide only basic functionality. “While these providers excel at their core competency – be it delivery of content or analysis – they most likely only provide basic personalization capabilities that do not take advantage of all available personalization technologies,” said Sachdev. “Personalization ‘add-ons’ are frequently acquired technologies and thus require additional installation. Although some solutions may fall short of a brand’s expectations, there are many others that are very capable of helping companies reach their customer experience goals. Be it for products or content, offering recommendations is perhaps the most well-established personalization strategy on the Web. Just because it is has been used before, however, doesn’t mean it’s outdated and ineffective. In fact, Baynote data indicates that consumers who engage with personalized recommendations convert, on average, 353 percent more frequently – reason enough for brands to make it a consideration. Evergage is an example of a company that offers personalization solutions for both merchants and information publishers. With its content publishing solution, Evergage helps brands present relevant and meaningful content to their visitors in order to increase metrics like page views, time on site and subscriptions. The solution uses behavioral data including previous actions and interests to deliver a personalized experience to customers in real-time. Brands can then A/B test their content for different audiences to optimize conversion rates, as well as leverage Evergage Promote to automate the process of promoting related content based on preferred authors, topics, tags and more. “When we work with our customers we take a ‘playbook’ approach and have different plays depending on the vertical,” said Karl Wirth, CEO of Evergage. Image: With its content publishing solution, Evergage can help brands understand visitors’ interests in order to promote relevant articles to those visitors. For information publishers, according to Wirth, that could mean figuring out how to get a user who has read one article to go on and read two or three more – getting more page views and, therefore, more revenue from that visit. There are also vertical-specific recommendation solution providers, such as RichRelevance, which just unveiled a new personalization platform dubbed RichRelevance Cloud. The new platform features product recommendation technology for retailers in addition to many other personalization tools, such as personalized product discovery – another incredibly powerful opportunity to boost conversions. Whereas Evergage provides readers with related content to increase page views, RichRelevance’s Discover product completely rearranges a store’s digital “shelves” (e.g. 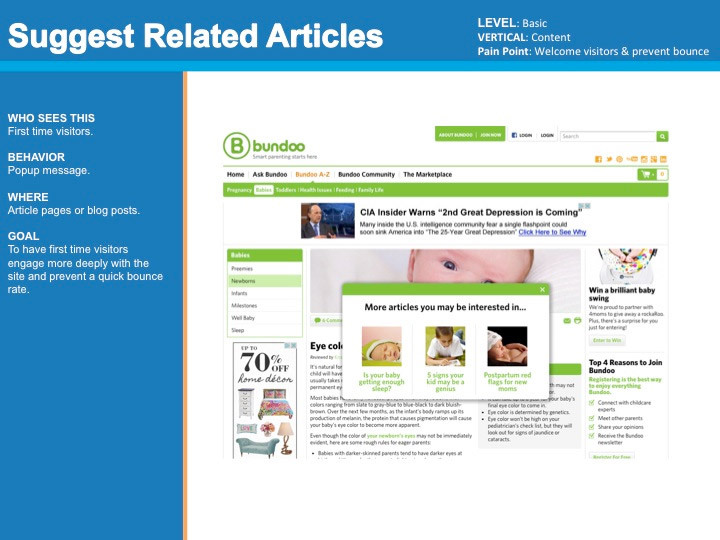 their on-site search results) based on individual relevance to enhance product discovery. In other words, they highly personalize on-site search results for each user. Using the shopper’s behavior and preferences (e.g. price sensitivity, brand, category, products and product newness) Discover re-orders product lists (when a customer searchers or browses a site) to move the most relevant products to the top. There are numerous technology providers catering to e-commerce merchants looking to personalize the search experience on their websites, including LI Systems, Nextopia and SearchSpring, as well as standalone plugins for e-commerce platforms, like Hawk Search for Magento. While personalized recommendations and product discovery are must-have technologies for websites, brands can also personalize their marketing strategies to create a relevant experience at every stage of the customer journey, from acquisition to post-conversion. Image: RichRelevance Discover offers a mobile sort feature, which personalizes the search and browsing experience. Customer experience is at the heart of personalization, and the same could be said of customer service. The tech world has taken notice and found ways to marry personalization and customer service in some truly unique ways, like with live video assistance. Adding videos to Web pages can dramatically increase metrics like time on site and conversions for brands across verticals. In fact, a recent study from Liveclicker found that merchants with videos on most of their product pages have a 68 percent higher average order value (AOV) than retailers that have videos on just a few pages. In addition to videos that highlight inventory and provide product demonstrations, merchants should also explore solutions and platforms that provide video assistance to their sites’ visitors. Vee24, for example, enables online retailers to deliver an in-store experience online with customer service via video chat. The company’s cloud-based VeeStudio solution enables these brands to assist customers through voice, video, text and co-browsing to make Web shopping experiences more personalized and ultimately reduce shopping cart abandonment. Moreover, this solution can be integrated into iOS and Android apps for consistency across devices and channels. Image: Vee24 enables brands to bridge the customer service gap by engaging customers via video chat. Video, however, isn’t just for customer service initiatives. Data from a 2014 Demand Metric study reveals that 82 percent of B2B marketers report success with video marketing initiatives too. This is likely why the majority of B2B marketers (63 percent) note that video marketing spending is on the rise for their organization. Many of them likely also know about video’s positive impact on a brand’s search engine optimization (SEO) initiatives. When a brand publishes video (especially on Google’s YouTube), it has the potential to occupy more virtual real estate on the search engine result pages (SERPs), increasing the likelihood of being clicked on by consumers. Plus, videos provide a great opportunity for brands to add content to their YouTube channels, which is the second largest search engine (behind Google), receiving more than a billion unique users monthly. While video is certainly an effective way for brands to increase engagement, there are other, more unique, ways brands can engage their customers too. One sure-fire way brands can increase engagement metrics and other important KPIs is by providing a more interactive website experience to consumers. Buzzfeed is an example of an information publisher that has been very successful at delivering interactive content to its audience. The publisher’s content star is undoubtedly its quizzes. In fact, quizzes have become so popular on BuzzFeed’s website that the publisher features a “Quizzes” category prominently in its main menu bar, as well as developed dedicated social accounts for this category on networks like Facebook and Twitter. It has even run some advertiser-sponsored quizzes for big brands including Mattel, which garnered nearly 200,000 shares. Luckily, the Web has taken note of the popularity of content quizzes, and there are now a variety of platforms publishers can leverage to create Buzzfeed-style quizzes for their own sites. SnappApp, for example, is a content marketing solution provider that can help brands create a variety of unique interactive content, including knowledge tests and quizzes. These quizzes can be leveraged to evaluate the knowledge or aptitude of an individual or group, and the results can then be used to deliver more personalized content experiences to audiences. 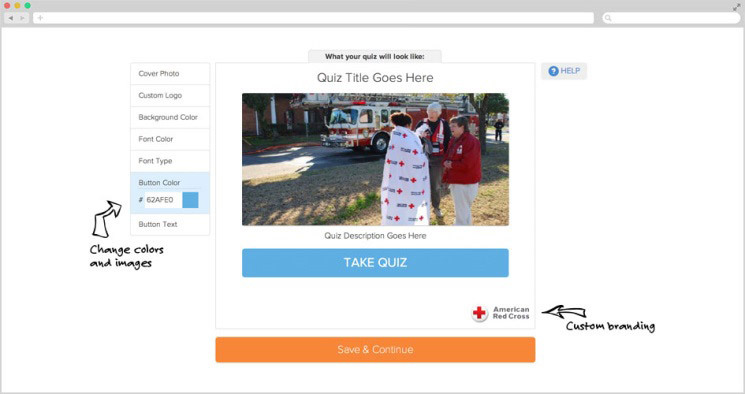 Another quiz-making platform is Interact, which has been leveraged by brands like CBS, Red Lobster and the American Red Cross. With Interact, enterprises have the ability to add custom branding to their quizzes and embed them on their websites. Plus, Interact integrates with a brand’s existing CRM to make it easy to capture new leads with the interactive content. Other quiz-making platforms worth checking out include Zoomstra and Qzzr. Image: With Interact, brands can create content quizzes and include their own custom branding. Aside from increasing engagement via interactive content marketing, retail brands can also focus on increasing engagement with their inventory by promoting interaction directly with their products. Technology like virtual fitting rooms provides a perfect avenue to do so. 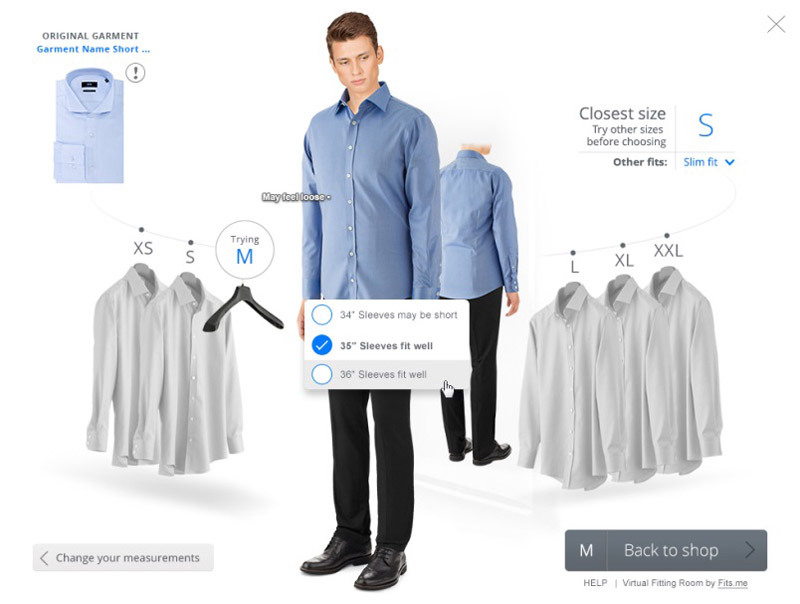 Virtual fitting room technology like Fits.me and True Fit, for instance, help retailers increase conversions and reduce returns by assisting customers with sizing recommendations. In addition to those important metrics, virtual fitting rooms engage consumers by encouraging them to interact with the technology (provide measurements) and virtually “try on” more items than they would have without a virtual fitting room. This can improve other KPIs like time spent on site, page views and average order values (AOV). Discover six virtual fitting rooms your e-commerce business might want to try on for size at wsm.co/tryon2014. Regardless of the tactic used, increasing on-site engagement should be a priority for brands. In doing so, brands will solidify their site as a must-visit digital destination for both their mobile and traditional desktop audiences. The old adage “the customer is always right” rings more true than ever in today’s age of the digital customer. The phrase’s modern meaning, however, puts the focus on the preferences of today’s digital consumer, which is different for each person. The time is now for brands to throw away the “one-size-fits-all” approach when it comes to customer experience and instead focus on providing the most unique, relevant and consistent experience possible to each and every website visitor they have – both on the traditional and mobile Web. Doing so will lead to more engaged and loyal customers, which is an invaluable combination. For further reading, check out “3 Fail-Proof Personalized Marketing Tactics to Try” at wsm.co/3persomar. + 98% of companies agree that personalization is key to current and future success. + Just 4% of companies describe their website experiences as “very” personalized.